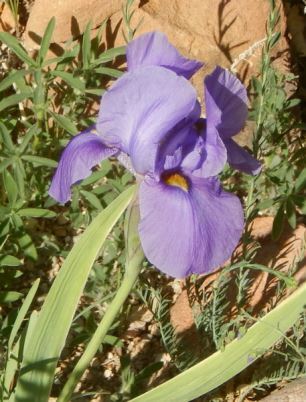 There are two types of aril irises: the oncocyclus that range from the southern Caucasus through eastern Turkey, Syria, Jordan, Iran, Lebanon, and Israel, and the Regelias from Turkestan and Afghanistan. 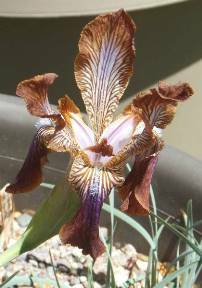 The oncocyclus group includes the most spectacular flowers in the genus Iris, and has inspired the devotion of enthusiasts for centuries. 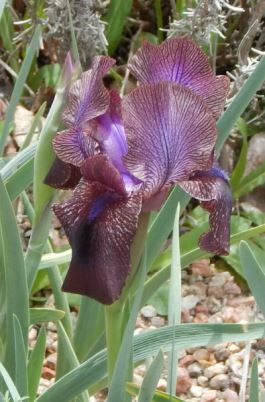 The Regelias, although less dramatic, are nonetheless interesting irises, with their elongated petals and unusual coloring. Two of the Regelia species, Ii. hoogiana and stolonifera, are natural tetraploids with 44 chromosomes. The other Regelias are diploids, as are all oncocycli, with 20 chromosomes. 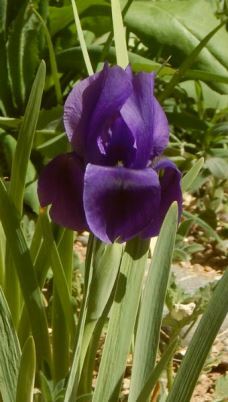 Although the Regelias have chromosomes in sets of 11 and the oncocycli in sets of 10, the chromosomes pair readily and diploid or tetraploid hybrids are usually perfectly fertile. 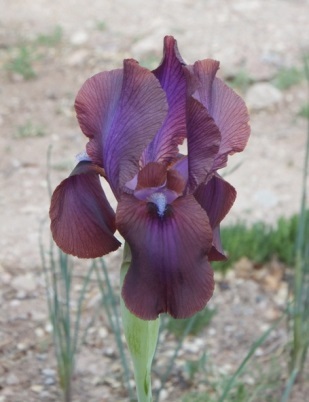 Tetraploid arils would be expected to produce fertile seedlings when crossed with the 48-chromosome bearded irises or with I. pumila, thus bypassing the sterility barriers that arise when the diploid arils are used. 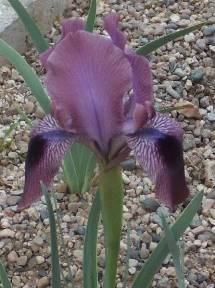 There are a few tetraploid aril hybrids with some oncocyclus ancestry, of which 'Persian Pansy' is an early example. In the 1970s and 1980s, John Holden and Sam Norris used colchicine to induce tetraploidy in oncocyclus and oncogelia hybrids.The process is a difficult one, as many seedlings either die or revert to the diploid state. Eventually, though, a number of tetraploid seedlings of mostly oncocyclus ancestry were produced, and a small handful were named and registered. It is unlikely that anyone will take up the work with colchicine again soon, so expanding the genetic base of this family requires crossing diploids with the available tetraploids, and hoping for an unreduced gamete or a triploid seedling with enough fertility to continue the line. This is extremely important work, not only to facilitate arilbred breeding, but because the oncocycli have very narrow habitats in a region of the world threatened by war and development. My own priority with this group is crossing the tetraploid arils with I. pumila and 48-chromosome medians to produce fertile arilbred dwarfs and medians. 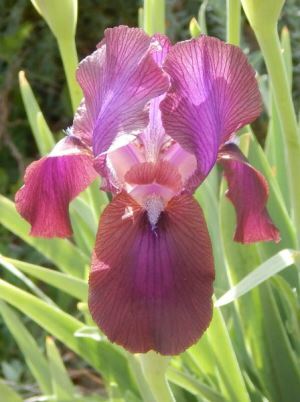 At the same time, I am crossing them with as many different oncocyclus species and hybrids as I am able to grow, in the hope of obtaining an occasional tetraploid. Given the difficulty of the crosses involved and the expected low germination rates, this is work that will require a great deal of patience. 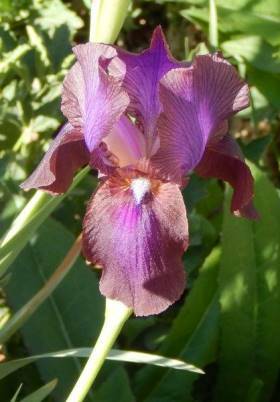 I've compiled a listing of tetraploid arils that may be of use in building a collection of these irises. 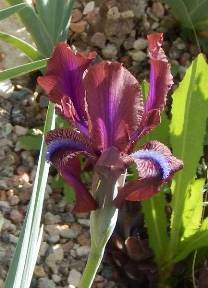 This is not a prime focus of mine, though I have made a few succesful crosses of diploid oncocyclus x tetraploid aril. No seedlings to report on yet. The Dutch firm of Van Tubergen introduced many aril hybrids over the years. 'Bronze Beauty' was one such. 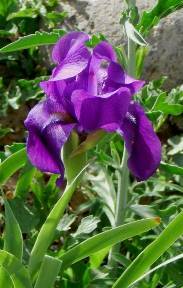 It combines the two tetraploid Regelia species, Ii. 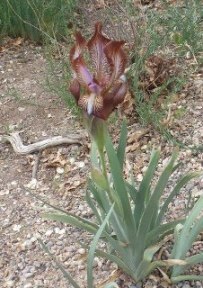 hoogiana and stolonifera into an attractive plant with hoogiana form but interesting, blended coloration. I've included it in the Hall of Fame as a kind of placeholder for the contribution of these two species to modern tetraploid aril breeding. It was finally registered by the Aril Society International in 2001. The long name 'Bronze Beauty Van Turbergen' was used because 'Bronze Beauty' was already taken, but it is unfortunately awkard. 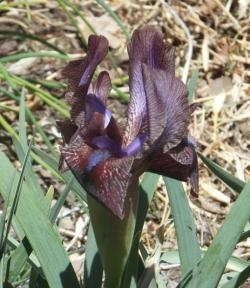 The plant has long been known as 'Bronze Beauty' and will continue to be referred to as such in informal contexts. 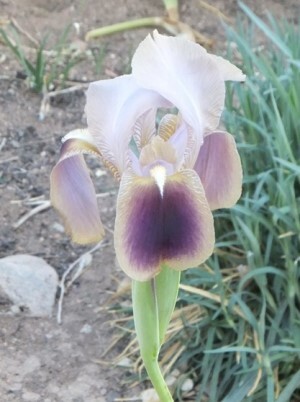 An accidental tetraploid resulting from an unreduced gamete from I. nigricans, this has long been the most onco-looking of tetraploid RCs, with form and coloration much more reminiscent of I. nigricans than I. hoogiana. It is fertile both ways, and has produced several registered offspring. 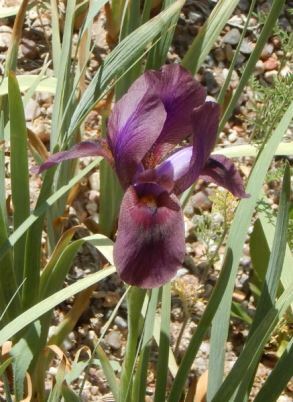 Even after tetraploid oncogelias were produced via colchicine treatment, 'Persian Pansy' remains a fine and important member of the tetraploid aril family. Werckmeister's Beauty (Peter Werckmeister by Sharon McAllister, R. 1992). Sdlg. 19161. AR/RC, 20" (51 cm), EM. 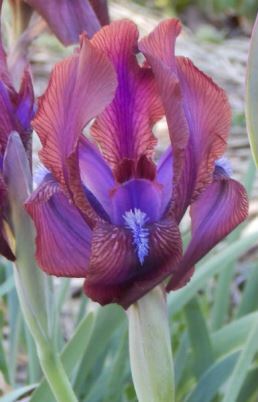 S. lavender gray, finely veined medium violet; F. lavender gray, intensely veined and dotted medium violet and washed violet; deep violet signal; orange yellow beards. 'Bronze Beauty Van Tubergen' x ('Teucros' x I. susiana). Aril Society, 1992. 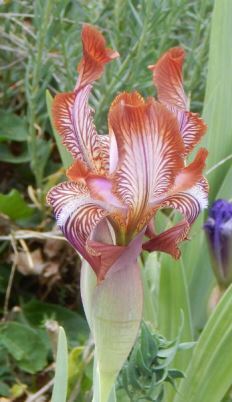 This tetraploid aril was produced by crossing 'Bronze Beauty Van Tubergen' with a colchicine-induced tetraploid oncogelia seedling. 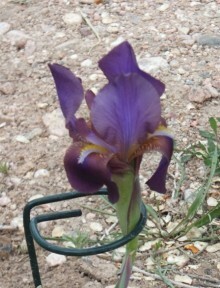 'Werckmeister's clone #2' (unregistered) has the same parentage, but is not a sibling, since the oncogelia parents of the two were not the same plant, but sibling seedlings. Although these tetraploids show their Regelia ancestry in their elongated flower form, they carry important oncocyclus genes and have proven durable garden plants and valuable breeders. Werckmeister's study of the meiosis of these plants indicated that they are aneuploids, nearer to triploid than tetraploid, despite an initial chromosome count indicating tetraploidy. 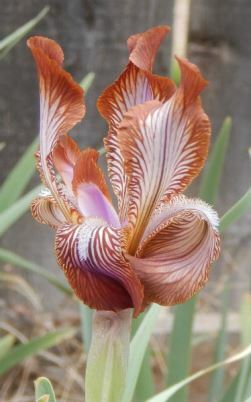 Nevertheless, many years of hybridizing experience has verified that they breed as fully functional tetraploid arils. Samuel Norris and John Holden produced a substantial number of tetraploid oncogelia seedlings by line breeding colchicine-induced tetraploids (indicated by seedling numbers beginning with "C" in the parentage). 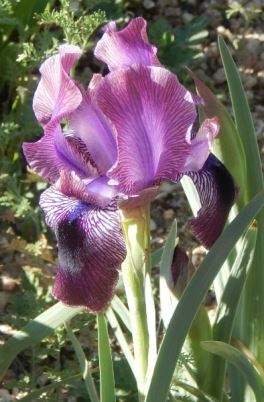 I have rather arbitrarily selected Norris T-N85G as a representative of this group, on account of it being used recently by Lawrence Ransom to produce the new tetraploid arils 'Tadzhiki Bandit' and 'Tadzhiki Eclipse'. It appears that most of these tetraploid seedlings have been lost, although perhaps a few are still being grown by specialists. 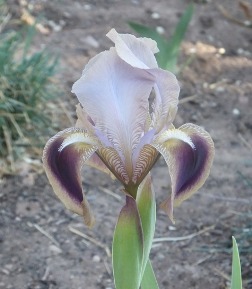 Ransom's "Tadzhiki brothers" are currently the most widely available tetraploid arils with strong oncocyclus content. The list below shows the name of each plant I currently grow, the source, and the year acquired. 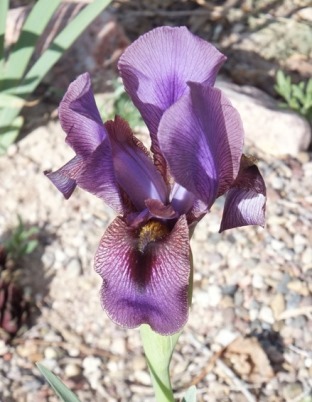 Illustration: 'Tel Hashi' (Kellie '68) a tetraploid aril hybrid (I. acutiloba x unknown).